Have a free couple days, an itch to travel but don’t want to go too far? Retreat to America’s Motor City for a weekend escape. Detroit has been developing a bit of a negative rap, as the center of much news concerning it’s distressed economy and challenging urban space. On the road to recovery the city serves as a great vacation getaway full of history and creativity. 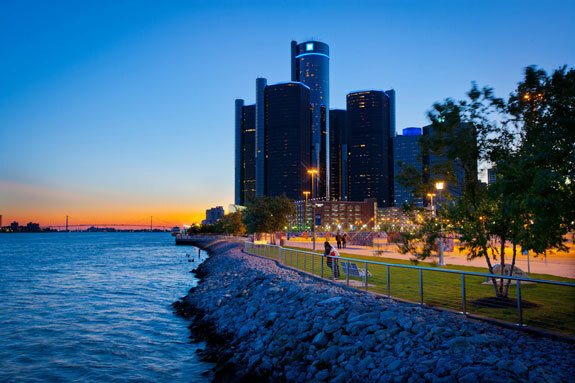 Enjoy a stay at the Cadillac Book Westin located in Downtown Detroit. The massive hotel has been around since 1924 and it’s Italian Renaissance inspired brick exterior is an attraction in itself. Complete with restaurants, a spa, and a pool, the Cadillac makes for a very posh weekend. For a cozier and more quaint visit, book a room at the Inn on Ferry Street. The Inn is made up of four restored Victorian mansions and two restored carriage houses creating a unique but beautiful aesthetic. Start your morning at Fleetwood Diner, a hippie themed 24-hour restaurant with a unique breakfast menu. Travel to Detroit’s neighboring college town of Ann Arbor for this twist on your classic diner experience. Ever tried hippie hash with your eggs? The ability to taste this deliciously creative dish and several other creative options makes this a must do on your trip. After a fun hippie morning hustle back downtown to participate in a longstanding Detroit food fight for lunch. The coney dog is a Detroit classic and so is the next door rivalry between restaurants American Coney Island and Lafayette Coney Island. The businesses were started by two Grecian brothers who immigrated to America almost a century ago. Enjoy a dog from both to help you decide your loyalty. Who knew you could get a quality dinner from the oldest car garage east of the Mississippi? Visit Vinsetta Garage for a hip and mouthwatering meal. Converted from a car garage to a custom Detroit eatery this place gets the job done when it comes to feeding patrons. Prepare to melt in your seat after ordering the 3 a.m. Burger served on a pretzel bun and topped with fried onions, egg, Siracha mayo and bacon. You might want to extend you stay after this meal as you may fall asleep right there. Enjoy Saturday morning at Eastern Market, Detroit’s six-block public market that has been around since 1891. With a variety of vendors the market serves as great way to see the bounty of local harvests. A perfect stop for the single traveler or a family, the market has a wide selection of fresh flowers, veggies, fruits, and homemade jams. No trip to Detroit is complete without visiting Hitsville, USA now home to the Motown Museum. Visit the space and stand in Studio A where Marvin Gaye, the Supremes and the Jackson 5 belted out some of your favorite classics. Visit the Gateway to Freedom statue on the Detroit Riverfront and recognize the critical role the city played in the Underground Railroad. The sculpture depicts a group of slaves looking across the Detroit River at Canada, where they would find a new home and freedom. A “sister” sculpture, the Tower of Freedom can be found across the river in Windsor, Canada and honors the strength and courage of the many slaves who made the dangerous journey. Visit Greektown to find nightlife in the city full of culture. Complete with casinos, bars, and lounges this historic section of the city is definitely a hotspot. In boththe fall and spring, the neighborhood goes into full swing with the Greek Independence Day Parade and Glendi Food Festival. Downtown, the speakeasy Café D’Mongo is a very eclectic mix of culture through food, drinks and music. Open only two days a week the spot is a definite must—just one drink special from this bar will start your night off with a bang. Overall, Detroit has plenty of gems to make it a short and sweet weekend destination. And as the city is experiencing a rebirth, set your sites on some great properties to own too while the rates are at an historic low. If you find a gem, you just owe Parlour a weekend stay!